Liverpool manager Jurgen Klopp must invoke the spirit of Bill Shankly, Bob Paisley and Istanbul 2005 if his cleverly assembled side are to follow up their table topping, epoch making English Premier League heroics with a fruitful Champions League campaign. On Tuesday night, last year’s losing finalists must subdue aesthetical Italian outfit Napoli by more than a single goal margin in order to maintain interest the world’s most coveted club trophy. Now in his fourth year as boss, the German tactician is yet to win any silverware but has wowed the Kop Army with his no holds barred, never say die approach to the beautiful game. With five ‘Big Ears’ to their name, Liverpool is the English club most synonymous with European success. However, the Kop have been blighted by a dodgy away record that has yielded no points from trips to Napoli, Paris Saint Germain and Red Star Belgrade. Liverpool will hence need to rely on their own formidable record at Anfield to overcome a Carlo Ancelotti coached side yet to lose away from Stadio San Paolo. When the Champions League draw was made, group C was tagged the Group of Death and it has lived up to expectations. Like Liverpool, Thomas Tuchel’s PSG are unbeaten in French Ligue One, but they too need maximum points at ever improving Red Star Belgrade if they are to live up to their high billing. England’s second representatives in action on Tuesday night are Tottenham Hotspur. Mauricio Pochettino’s Londoners have hit a rich vein of form at the right time ahead of a clash Barcelona at the Camp Nou. Though Ernesto Valverde’s Blagruana are already through to the round of 16, they won’t be slowing down against a Spurs outfit they obliterated 4-2 at Wembley Stadium. Luciano Spalleti’s Inter Milan have the more straightforward Group B fixture at home to Marco van Bommel’s PSV Eindhoven. 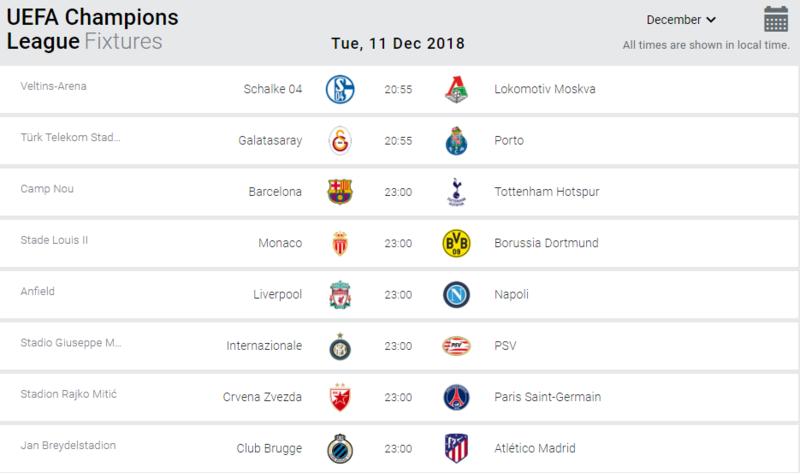 In Brugge, Diego Simeone’s Atletico Madrid will be defending a two point advantage atop Group A when they confront Belgian champions Club Brugge. Lucien Favre’s stylists from Dortmund are away to Thierry Henry’s beleaguered Monaco in the other group A encounter.